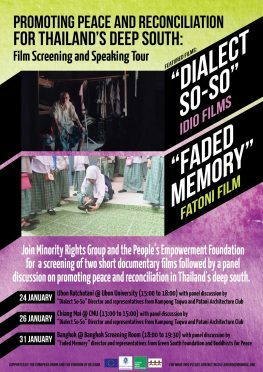 Minority Rights Group and the People’s Empowerment Foundation will be screening two short documentary films at the Bangkok Screening Room on 31st January at 18:00. The screening will be followed by panel discussion between the director of Fatoni Films and representatives from Buddhists for Peace (a CSO working on promoting peace and reconciliation between Buddhist and Muslim communities in the deep south) and the Green South Foundation (a CSO that has been resisting a coal fire plant in the district of Thepa in Songkla provice). MRG has been working on empowering Thai civil society organisations that represent marginalized communities in the Southern Border Provinces. Decades of conflict between the Thai state and ethnic Malay separatists in the region have resulted in tensions between Melayu-Muslim and ethnic Thai and Chinese communities. MRG’s programme aimed to contribute to peacebuilding, promote peaceful relationships and increase constructive dialogue between ethnic communities in the region. This event will be an opportunity to reflect on the progress made during the programme. Entrance is free. Bangkok Screening Room is located on 2nd floor of the Woof Pack building (opposite the U Chu Liang building) on the corner of the Sala Daeng Soi 1 and Rama IV, Silom, Bangkok.